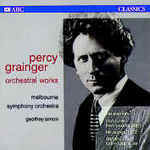 Orchestral works / Percy Grainger. Beautiful fresh flower : Chinese melody, for piano solo / Percy Grainger. Instrumentation: 4 violins, viola, violoncello, double bass, percussion. May be played by a larger ensemble.